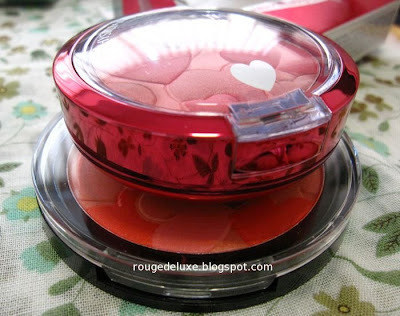 When Physicians Formula launched its Happy Booster collection of blushes and face powders a few months ago, it quickly became a hit thanks to the endearing heart motifs and cute pink packaging. During a recent trip to the US, I managed to hunt down the Happy Booster blush in Rose at a CVS. With only one piece remaining on the shelves, I quickly snapped it up and traipsed to another CVS, where again there was just one piece remaining and I got that for Mag (Makeup Stash). The blush also comes in Natural. 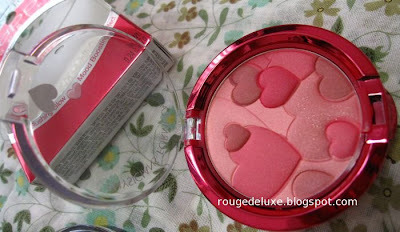 The Happy Booster Blush is truly a drugstore gem as the blush is very well pigmented, long-lasting and silky to touch. It does have a strong "mood boosting" violet scent, which some may not like but I don't mind it. 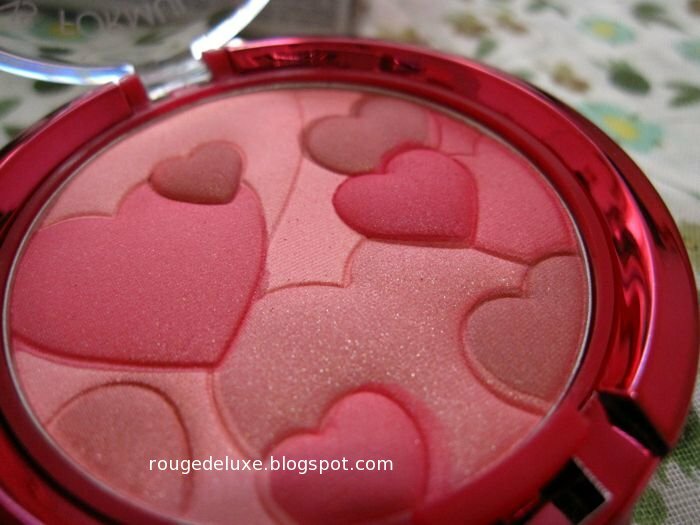 The paraben-free blush contains natural plant extracts that are supposed to mimic the effects of endorphins. I can't say how effective those plant extracts actually are but just looking at the blush each time I use it makes me smile, and that definitely is a mood booster! The finish is mostly matte without any frostiness. The blush pan flips up to reveal a mirror and a brush. One big flaw of Physicians Formuala's products is that they often come with terrible brushes that are so scratchy that it would have been better to leave them out altogether. 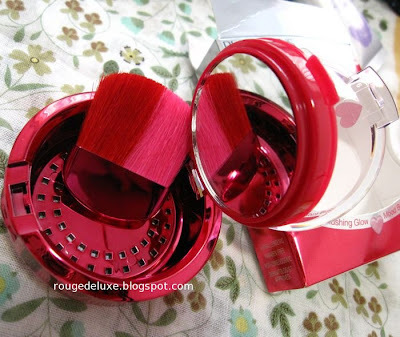 The red and pink brush in the Happy Booster looks cute and does a decent job of applying and blending the blush. It's not as rough or scratchy as some other PF brushes I've tried but it's still not soft enough for my liking. It has also started shedding sporadically. 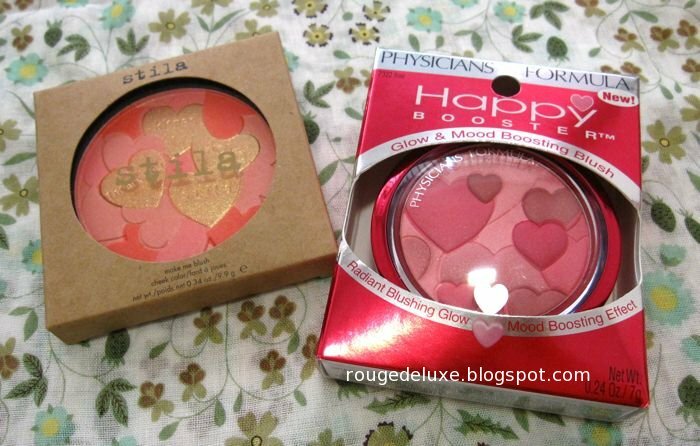 The Happy Booster has a fraternal twin in Stila Make Me Blush, which was also released around January. Make Me Blush is more coral and peachy pink toned than the Rose Happy Booster. The gold overspray on the hearts disappears very quickly. 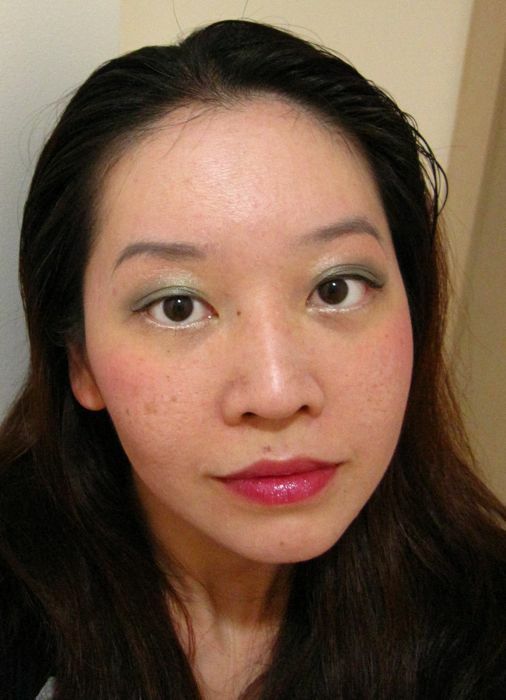 Of the two, I find Rose Happy Booster to be slightly more pigmented. With the Happy Booster, I often step back from the mirror to find that the effect is more intense than I like and then I have to tone it down by wiping some off and dusting loose powder on top. Naturalnchicmakeup has an excellent post comparing Make Me Blush with MAC's Marine Life. 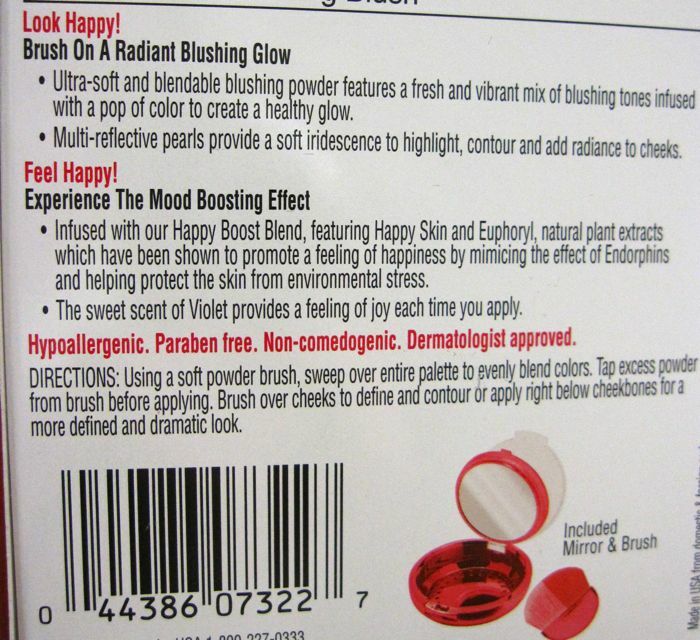 Below is the ingredients list for Happy Booster, which is "made in the USA from domestic and foreign parts". Net weight is 0.24oz/7g. Make Me Blush, on the other hand, is made in China. Ingredients list below. The net weight is 0.34oz/9.9g. 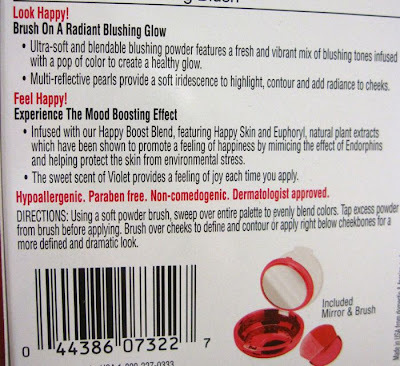 Price-wise, Make Me Blush was US$14 versus US$11.99 for Happy Booster. There was a $3 off sticker with my Happy Booster and I had a 20% discount code for Make Me Blush. I like the fuss-free packaging of both blushes. The Happy Booster is bulkier but the brush does a decent job and would be convenient for travel. Here's the look that I did with the Rose Happy Booster. 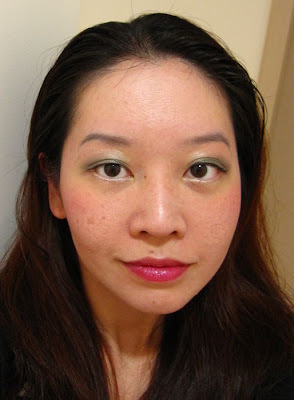 I used the Stila Make Me Blush in this earlier look. 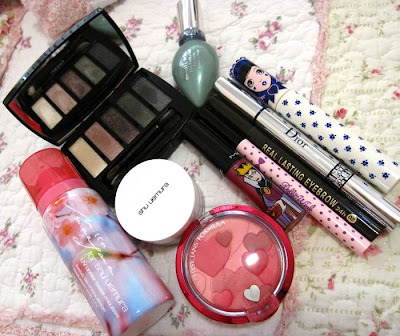 The other products that I used for this look. 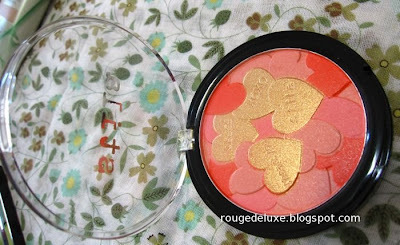 Make Me Blush is limited edition and no longer available but Happy Booster is fortunately permanent. 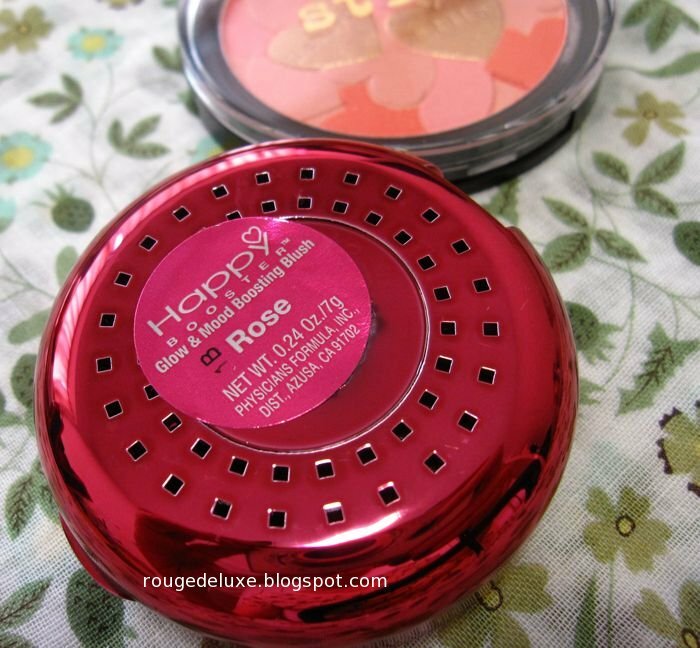 The Happy Booster blushes are definitely worth hunting down if you visit the US, or if you are in Singapore, one option is to order from drugstore.com and ship via VPost, Comgateway or Borderlinx. 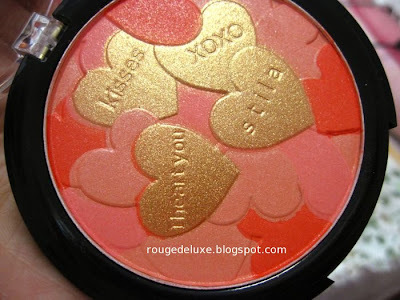 The blush looks good on you! I have it in Rose too and I really like it. I got all the blushes and bronzers from the happy booster collection, their bronzers are so good! Thanks! Am really glad that I managed to find it. The bronzers looked cute too but I don't use bronzer so I passed on them.